To correspond with the curves and flowing lines of the scenery, a unique bench was created to harmoniously blend into it's fixed position. 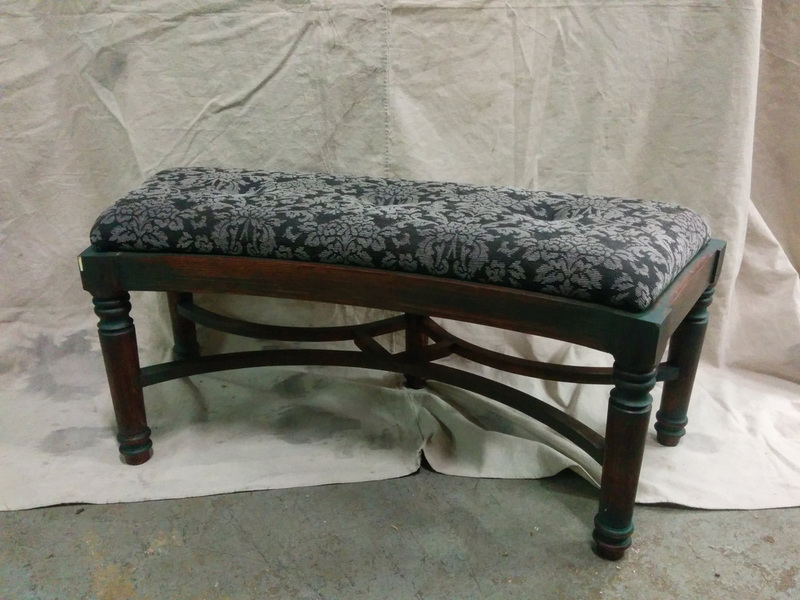 The biggest challenge with this piece was to gracefully dowel the turned legs (purchased) and the stretcher. As the stretcher came into contact with the leg at a point that was not on the same plane with its square top, it was necessary to determine the angle at which the two pieces met. After the angle was determined, which differed from leg to leg, a custom jig was made so a drill press could make the necessary dowel hole. The stretcher had its corresponding dowel hole drilled with a traditional doweling jig. In the glue up of the legs to the stretcher, cauls were utilized in the absence of flat/square surface to clamp to. The bench's top was made by printing out a full scale profile of the frame's lid, applied to the legs to then have the frame built to fit. The legs were maple and the frame utilized poplar, 1/2" plywood and bendy plywood that was later covered with maple veneer. Painted by Sophia Briones and upholstered by Cassandra Westover.